Previously, I needed flight primarily for picking flowers. No flowers mean no potions, no potions mean no raiding. I would spend hours swooping around enjoying the scenery and grabbing all the herbs I could. Remember when you’d be swooping down on a flower and some assface druid swooped faster and didn’t even have to shapeshift? Yeah, those were the days. I’m putting out fires in bird form carrying a freaking bucket in my beak. 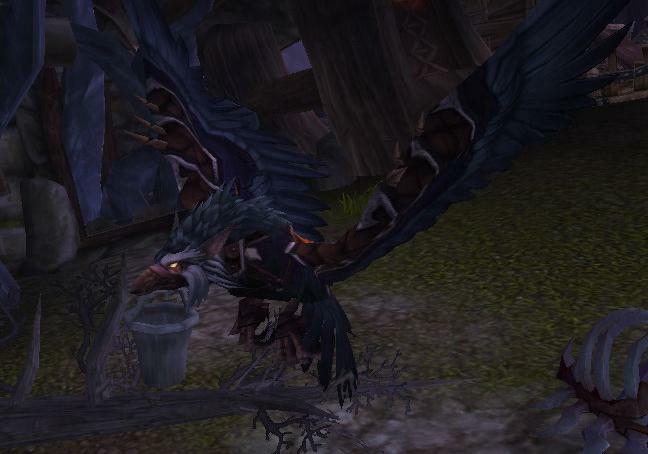 In WOD, I have not been out herbing once because WOD is no longer based on a society of hunter and gatherers. We’ve been evolved, whether we like it or not. Anything I want, I grow myself in my stupid garrison. While at first it was convenient, later we realized it was just a monstrous chore. Instead of circling and swooping, I’m poking from planter to planter on a tiny little plot of land, sending out my idiots, and putting in work orders. A chore that was formerly at least marginally fun is reduced to garrison tending or, out in the world, the hack and slash of the leveling process to fight your way to your resources. The devs talk about the world being vast and full of danger – and I never see it because it is too time consuming to gather flowers on foot. And you don’t get a sense of vastness when you’re toe to toe with monsterface on the way to a flower. It narrows perspective instead of broadening it. You can’t roll back the clock and revert the game – it has to move forward. But settlers are boring and are most certainly not the adventurers that hunters and gatherers are. Welp, it’s “World of Warcraft”, not “World of Herbcraft”, and I’m pretty sure that the main axis of game dynamics in the game is not build around herbing or mining, in that the first question that came up in the planning session was probably not “How can we make herbing exciting?” It wouldn’t be mine, honestly. So I think the better conclusion is that the world of herb farmers has changed somewhat in this expansion, and their perception of the game is probably not a big factor in design decisions they’ve made. That said, what they’ve done to herb and flask sellers on the AH is pretty nasty. Flasks are practically worthless and my glyph monger doesn’t even have to leave the convenience of Stormwind to keep cash flow going. I’m not even sure why you’re bothering to make flasks when you can buy them on the AH for less than the cost of dinner at Denny’s. There’s only so much I’ll do in the name of self-sufficiency, and farming herbs in any way far exceeds the line given the cash flow from garrison missions alone.